This image is called the City of Angels. The idea behind this image is that aliens have come to the earth. It turned out that they are the landlords and they didn't like the way we took care of the property. Therefore, they cancelled humanity's lease to the planet and sent us on our way. 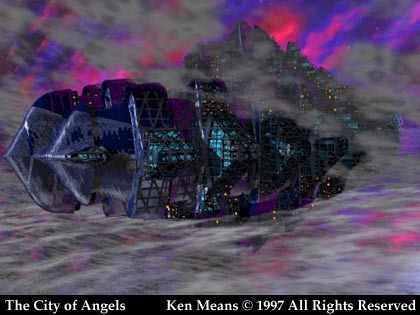 The City of Angels is the city of Los Angeles crated up and shipped off to points unknown. The same fate befell all earth communities and humanity was scattered in all directions.